We use many wonderful tools in our shop to help us do our creative work. One of the fancier tools is our MultiCam CNC router. I can build complex 3D files on my computer and then the machine follows the digital pattern to automatically create the part I have designed. It is simply amazing! But technology is always changing and it is necessary to reinvest and upgrade from time to time. 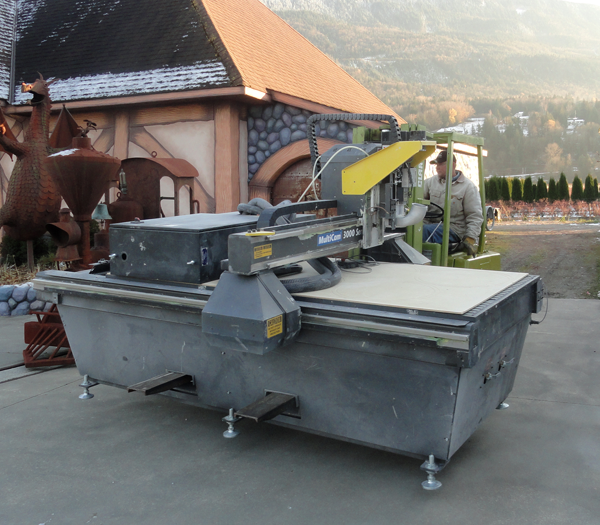 Our latest tool is a four axis MultiCam CNC router. It can do everything our old router could but also is able to turn the work as it is routed to build truly three dimensional pieces in one go instead of multiple passes. It will help us create even more amazing projects in the future. Our new machine has been on order for some time for it is a custom builtpiece of equipment. Now at last it is in trasit from Texas to our shop. Today's job was to unhook the old MultiCam to make room for the new. It will be transported back to the manufacturer in Texas for refurbishment before it goes to new home somewhere in the US. It should run for many, many years yet. My good neighbor Gord brought over his trusty forklift for the heavy duty job. The machine weighs in at more than 4000 lbs. We would do this no other way. The machine was carefully slid out the large door of the router room and then brought around to the main shop. I'll finish wrapping it here before it gets put on the truck next week. It will be like Christmas come next week as we unwrap the new MultiCam. I can hardly wait!